Green Lipped Mussel Extract with Glucosamine. 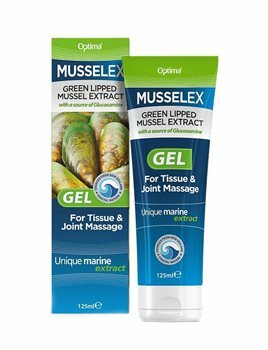 Optima Musselflex Gel contains essential elements from the sea which supply the connective tissue with important nutrients. Initial application creates a pleasant cooling effect due to the menthol content, whilst the essential oils aid circulation to the skin, resulting in a warming sensation. Optima Musselflex Gel smells pleasantly fresh, is non-greasy and absorbs immediately. Aqua, Dicaprylyl Ether, Polysorbate 20,Menthol, Pinus Glycosaminoglycans, Propylene Glycol, Mussel Extract, Citrus Dulcis, Citrus Limonium, Eucalyptus Globulus, Rosmarinus Oficinalis, Acrylates/c10-30 Alkyl Acrylate Crosspolymer, Disodium Edta, Sodium Hydroxide, Phenoxyethanol, Methylparaben, Propylparaben, Citral, Limonene, Linalool. For external use only. Do not use on small children. Avoid contact with the eyes. Do not use on broken skin. If irritation develops discontinue use. My wife and I have been using this product for a few years now and find it extremely good at combating joint pain in knees (and indeed any joint pain) and for helping with back pain. Have tried this gel for some time now and it certainly works. Have recommended it to several friends and they all sy the same thing.